The Danube is the second longest river in Europe, 2860 km. The Danube is the most important river in Hungary and in Budapest. Danube width is 350 meter at ” Lanchid ” bridge. The depth is between 3-10 meters in Budapest. During his journey through mountains, gushing, inculcation cleft in the rock, aggravated valleys between the mountains, vast plains filled up. It flows through Germany, Austria, Slovakia, Hungary, Croatia, Serbia, Romania, Bulgaria, Ukraine. The most beautiful part of the Danube journey in Budapest, where you can see many ancient buildings from the boat. The great Danube is marvellous. Tourists favourite part of cities is generally by the river. There is something soothing in the air, and most cities make their rivers the main attraction. A wide river where you can outstanding majesty of the royal palace. You can’t imagine that panorama photos of River Danube in Budapest are not airbrushed. As a matter of fact, they are real, amazing, and must be seen. We believe that Piano battle show or Folklore programme on Silverline boat on the Danube is the best pastime for a tourist. Every guest says it was amazing to see the city from a very different view. 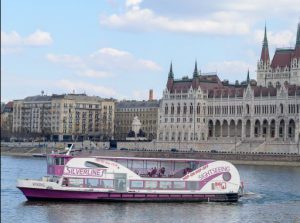 Budapest Sightseeing Cruise © 2019. All Rights Reserved.